Some weekends, when I don’t have anything on, I send out a barrage of text invitations to friends I’ve not seen in a while to pop by for tea. Usually, I haven’t seen these people for a reason: they are more organised than I am and will already have an action-packed weekend planned. Clearly, this weekend, everyone was at a similar loose end. On Friday night, I suddenly found myself booked in for an entire weekend of morning, afternoon and evening tea and coffee. 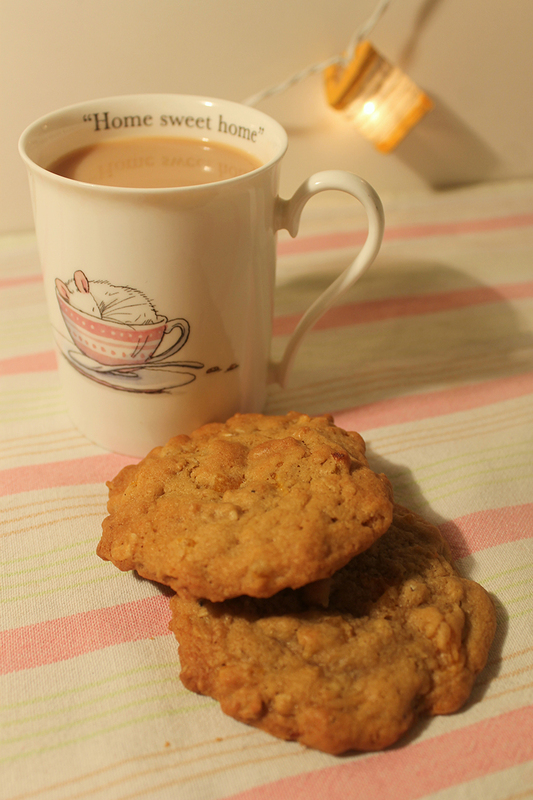 This is my favourite cookie recipe. It’s a real cookie, never a biscuit, no matter what country you’re in. Chunks of chocolate, nugets of walnut, chewey porridge oats. If I was the sort that liked to eat raw cookie dough – and surprisingly I’m not – I suspect that I could put Ben and Jerry’s out of business. 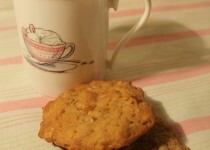 I adapted this cookie from a recipe in a book called Boston Tea Parties: Recipes from the Museum of Fine Arts. My mother bought this book at the MFA on the same day that we visited Boston Harbor when I was about twelve. Even now, whenever I think of the Boston Tea Party, I imagine colonists dressed as Mohawk warriors, nibbling on dainty cakes and cookies as they throw fine china cups and saucers of tea into the harbour. Well, I never promised a history lesson. 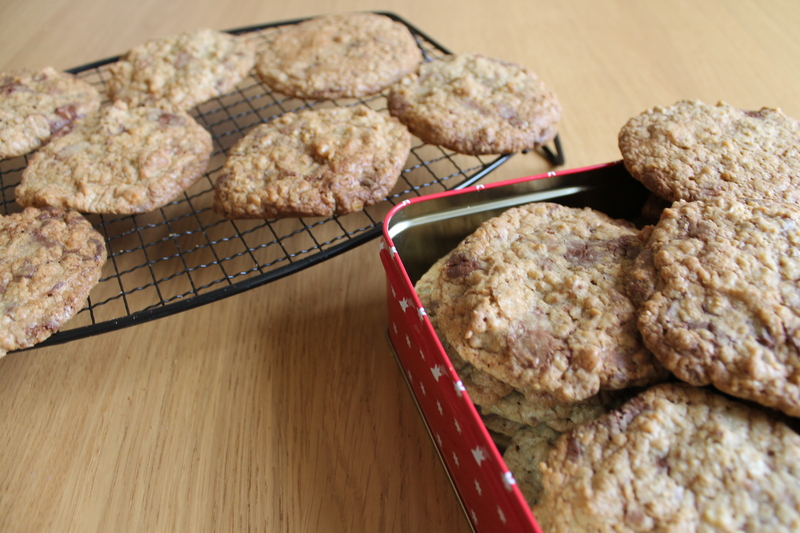 But I do promise some seriously large cookies. Consuming one of these ugly giants may seem daunting at first, but I’m betting that you’ll manage two or three with a good pot of tea, I mean coffee. Cream together sugars and butter. Beat in the eggs and hot water. Sift together the flours, soda and salt. Add the dry ingredients to the creamed mixture and stir to combine. Chop the chocolate into medium chunks. Add the chocolate, oats, walnuts and vanilla to the mixture and stir. Drop large tablespoonfuls of the dough onto a baking sheet, spaced 5 centimetres apart. Bake in a preheated 190 oven for 10 minutes. Leave to cool on the tray for 10 minutes before removing to a rack.